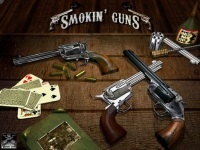 Smokin' Guns is an open source-classical western first person shooter game. Originally, it was developed by Iron Claw Interactive under the name of Western Quake (WQ). In 2005, WQ was converted into a standalone game with a new name, Smokin 'Guns. The developement continued under a new team named Smokin' Guns Productions. Smokin' Guns is a semi-realistic simulation of the cowboys-western era in the past. Classical environment and sound exist on every aspect through the gameplay. This game can be played in single player mode against the computer and multiplayer via LAN and Internet.